This was an interesting series in a few ways. For one, Joe Saunders threw a complete game. For two, Jesus Montero hit a triple. Three, Kendrys Morales beat out a dropped third strike to reach base. We also saw the heralded return of Michael Saunders. Did that spark the offense? It sure didn't hurt. We also saw another bump in the road for Brandon Maurer. With him being a young rookie trying to adjust as he goes along, bumps in the road are to be expected. Aaron Harang also did well against the Orioles, but I still think he's not somebody that needs to be in the rotation. The Mariners already have a rookie in the rotation, but see what Hector Noesi can do and if he fails, cut bait and bring up another young guy. Competing for the playoffs this year is a little insane and after 5 years of veteran stopgaps, it's gotten really old. No pun intended. With that, the stats and various other things to recap the series. In fairness to the bullpen, most of those numbers come from Blake Beavan, who is back down in Tacoma to get stretched out as a starter again. Lucas Luetge was called up and can only be a massive improvement over Beavan, who has struggled all season so far, especially out of the bullpen. We'll see how much playing time Luetge gets with 2 other lefties in the pen, but knowing Wedge, he'll get his innings in by the time the season is over. The first game saw Joe Saunders throw a complete game and Michael Saunders hit a lead off home run in the bottom of the first in his return from the DL. It was a good day to be a fan of this baseball team we affectionately call the M's and they got it done both on the mound and at the plate. Joe Saunders was stellar throughout the game, save for a two run homer given up to Chris Davis in the top of the fourth. Other than that, he mixed his pitches and kept the Orioles hitters guessing. I stated before, I believe on twitter, that even with a 4 run lead and Saunders on the mound at Safeco, I wasn't all that confident. Not that I think he's a poor pitcher, but he reminds me of Vargas to a degree and he has to have perfect command to succeed. He had it that night, but over the course of the season on any given start, I cringe before the first pitch is even thrown. I don't think his ERA will stay above 5, but I don't think it will come down much below 4.5 either. Hopefully he blows that statement out of the water and I will gladly eat crow on that one. As I mentioned earlier, Saunders homered to lead off the first. Off of a left handed starter. Actually, both of his home runs this season have come against left handed pitching, which is just weird. It's nice to see him becoming the player we all hoped he'd be a couple of years ago. Offensively, most of the lineup was on their game. Jason Bay contributed with a 3 for 4 night with a double and an RBI. He's another veteran I don't trust long term, but he has his average to a respectable level at least, hitting .269 for the season with a couple of home runs and 6 RBI. Again, I trust him about as far as I can throw him, but seeing him succeed after what he's been through injury-wise is, I don't know, neat? We'll go with neat. Kyle Seager checked in with a triple also, which is also neat. He's a guy I hope sticks around for a long time at the hot corner. If he doesn't, maybe we can get Chone Figgins back. God what a horrendous thought. I digress. Justin Smoak has been doing better as of late, but only time will tell if this is something or just an aberration. Hitters go through streaks and for Smoak, this may just be a hot streak that will cool off at some point. Even if this is a hot streak, he has 24 hits and only 6 for extra bases. His slugging percentage is .320 and for a first baseman, that just won't cut it. We'll have to see what he does for the rest of the season, but right now, there's no confidence in him from anybody outside the organization. The second game of the series was lackluster, to put it mildly. However, most of it came from Maurer and Beavan on the pitching side, but the hitters didn't do much either. Sticking with the pitchers, Maurer had no feel for his pitches for most of the night. He struggled to get his slider anywhere near the strike zone and he was leaving pitches where pitches should not be left. Again, he's a 22 year old rookie, so starts like this are going to happen. It's his first time pitching above Double-A and while the raw talent is there, starts like this makes it obvious he still has another year or two to go before he hits his stride. Beavan came on in relief of Maurer in the fifth and Beavan did what Beavan do. Let's not relive it. On the offensive side of the ball, Smoak got himself a double and Mike Morse got himself another home run. Unfortunately, that was about all the offense did. They managed to get 10 hits, but only two of those went for extra bases. They also decided they liked the RISP average before when it was lower and went 1-8 in the game. Overall, it was an abysmal showing by the offense, highlighted only by the home run by Morse. Last but not least, the rubber match of the 3 game series. Harang went 6 strong innings and gave way to the bullpen, who did what they're supposed to do, which is get the other team out. Carter Capps made a mistake and gave up a solo shot to Machado, but by then the score was 8-2. That was enough to concern Wedge though, since Wedge immediately went and got Charlie Furbush from the bullpen to face the lefty hitting Markakis. Playing the matchups in the bottom of the 8th of an 8-3 game. And baseball brass wonder why games take forever. This is the game that Montero hit his triple. The ball bounced off of Jones' glove, Jones hit the wall and McLouth picked it up to get it back in to the infield. The video of Montero running to second and rounding the bag to head for third has provided hours of entertainment. 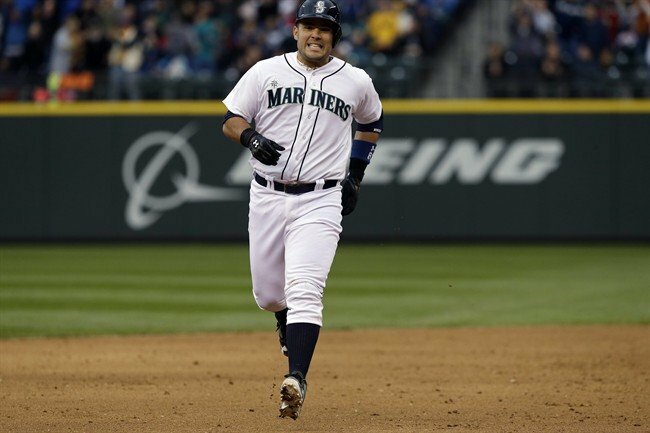 Montero looks the tin man trying to run the bases after having gone most of the day without oil. Do yourself a favor and watch. If you aren't laughing after 30 seconds, there's something wrong with you. The Mariners busted out the bats in this one with Montero's triple being just one of the 5 extra base hits in the game. The offense is starting to show signs of life and that can only mean that we're seeing what this offense should have been from the start. At least, I hope that's what it means. Otherwise, I'll be very concerned about the rest of the season. On a happier note, Morse became the first Mariner to hit at least 9 home runs in the first 30 games since Mike Cameron did it in 2002. I don't think he'll end up hitting 45+ home runs, but you never know I guess. If he can stay healthy, it's entirely possible. He's never done it before, but let's stay optimistic for now, shall we? The Mariners have won back-to-back series, taking 3 of 4 from the Angels and 2 of 3 from the Orioles. The offense has slowly been improving with each series. In the first 5 series of the season, their batting average in each was .231, .219, .241, .218 and .188. In the last three, their average has been .288, .295 and .311. The last three have brought the team average up to .245. A .300 average over the course of a season is almost impossible, but they're getting back to respectable and winning games in the process. The season is a month old and we've seen the worst of this offense and something close to, if not the, best they have to offer. The Mariners are finally starting to click and, hopefully, they'll continue to hit for the rest of the season now that they've figured out how to do it.